Vote for the Next New KIDZStar! Support the Treasure Your Chest Program! I Just Joined Picket Fence Blogs! Elmer’s Prize Pack Winners for Fall Fix It Week! Try Peaceful Sleep to Help You Rest and Relax! Furnishing Your Adult Child’s First Apartment! Celebrate Fall and Halloween at IHOP! 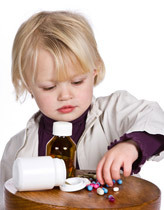 It’s no surprise that the consequences can be deadly when children get into medications. Prescription drugs, birth-control pills, cough and cold remedies, diabetic supplies… all pose a serious risk to kids. And it only takes a second for them to grab them out of the cupboard. If you’ve got little ones in the house, it’s very important to keep your medications locked up. But don’t think this is only necessary for babies and toddlers. School-aged kids and teens may find that medications look very tempting or feel the need to experiment. According to the Substance Abuse and Mental Health Services Administration, more than 3,000 children begin experimenting with prescription drugs every day and over 3 million U.S. teens abuse prescription drugs. LOCKMED has a line of lockboxes that are specially designed to keep your medications out of reach. The small and medium sizes use a combination lock, and the large (commercial) size has a key lock. All of them have a strong reinforced aluminum exterior and are lined with a classy dark velvet interior. The small size is great for travel. I received a LOCKMED lockbox and was very pleased to see the reinforced corners, the pads on the bottom to prevent scratching, and the convenient carrying handle. Everyone should have a LOCKMED lockbox in their house for both prescription and non-prescription medications. Visit www.lockmed.com to order a lockbox. They’re all extremely reasonably priced between $19-23! It’s a very small investment to make to keep your children safe. DISCLOSURE: I received a complimentary LOCKMED lockbox to facilitate my candid review. No other compensation was provided.